General Washington and bicyclists have (at least) one thing in common: difficulty in crossing the Delaware. 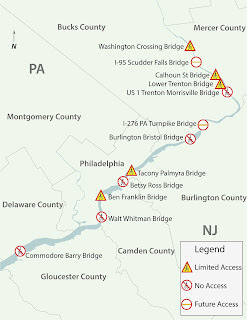 After examining twelve bridges that connect New Jersey and Pennsylvania at or near Philadelphia, we are releasing a new report that reveals how poorly the Delaware River bridges provide bicycle and pedestrian accessibility. The report, “Crossover: Bridge Ahead Impassible” finds that only five of the twelve bridges studied allow access to bicycles or pedestrians, and even then, the limited access provided by those five bridges is restricted further by regulations. The report lays out specific short-term recommendations for each bridge to improve access for bicycles and pedestrians. “Crossover” then provides longer-term solutions and identifies the regional agencies who would be responsible for, and capable of, implementing those changes. From the press release: "'Municipalities on both sides of the river are investing heavily in better and safer bicycle and pedestrian infrastructure. But the benefits of these networks are stymied by bridges which, somewhat ironically, serve as barriers to connection,' said John Boyle, Research Director for the Bicycle Coalition. 'The "Complete Streets" concept driving much of this investment does not exempt bridges. Travelling from Pennsylvania to New Jersey should not require immediate automobile access, especially when communities on both sides of the river are seeking to facilitate cross-river access to drive economic stimulus.'" Retrofitting bridges with bicycle and pedestrian accommodations when bridges undergo major rehabilitation projects. Connecting existing bridge pathways with bike lanes, sidewalks and major trails. Collaboration between transit agencies, police departments, and taxi operators to provide reliable transportation services over bridges. We have long advocated for improved bicycle and pedestrian access on the Ben Franklin Bridge. 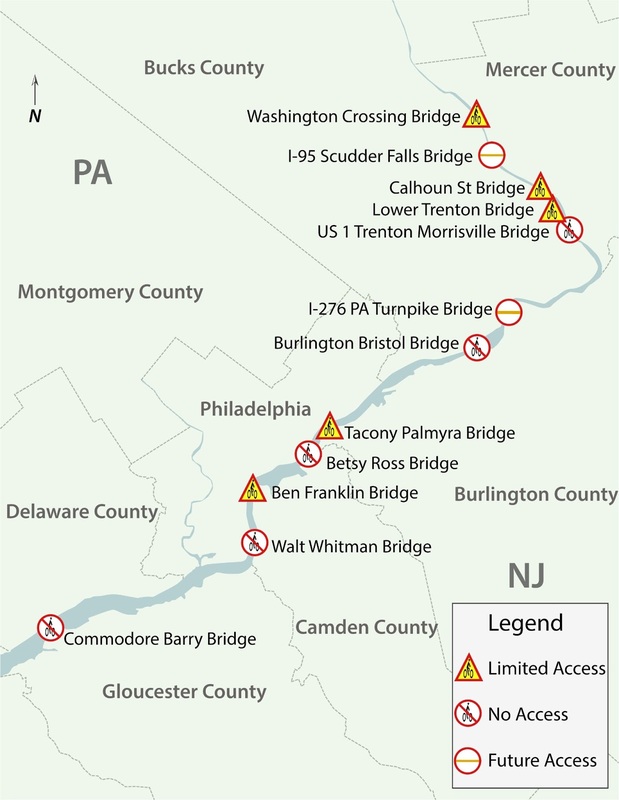 With this report, we shine a new light on our river's other bridges, and how their inaccessibility to pedestrians and bicyclists is stymieing trail networks being built on both sides of the Delaware. You can read the full 15-page Crossover report here. good report. thanks for alerting me to it, John.